A requirement of Part G3 of the Building Regulations requires that anyone who intends to install or installs Un-vented Hot Water Storage systems for domestic purposes must hold a current certificate of competence, to show that they know the safety requirements and good installation practices for the type of hot water storage units. 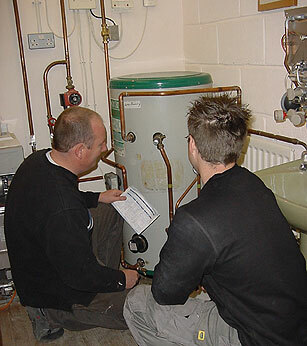 This one day training and assessment package is aimed at practicing plumbers and heating engineers who already have a knowledge of the fundamental requirements of hot and cold water systems and central heating systems, or students who are nearing completion of a plumbing and heating vocational qualification at level 3 and who wish to improve their knowledge and skills in the installation and maintenance of Un-vented Hot Water Systems. By undertaking training and assessment in Un-vented Hot Water Storage Systems, you will no longer need to contact your local Building Control Officer to approve your work. You will be recognized as being competent to design, install, service and maintain un-vented systems and can therefore self-certify your work.